The dsp.CICDecimator System object™ decimates an input signal using a cascaded integrator-comb (CIC) decimation filter. The CIC decimation filter structure consists of N sections of cascaded integrators, followed by a rate change by a factor of R, followed by N sections of cascaded comb filters. For details, see Algorithms. The NumSections property specifies N, the number of sections in the CIC filter. The DecimationFactor property specifies R, the decimation factor. The getFixedPointInfo function returns the word lengths and fraction lengths of the fixed-point sections and the output for the dsp.CICDecimator System object. You can also generate HDL code for this System object using the generatehdl function. This object requires a Fixed-Point Designer™ license. Create the dsp.CICDecimator object and set its properties. cicDecim = dsp.CICDecimator creates a CIC decimation System object that applies a CIC decimation filter to the input signal. cicDecim = dsp.CICDecimator(R,M,N) creates a CIC decimation object with the DecimationFactor property set to R, the DifferentialDelay property set to M, and the NumSections property set to N.
cicDecim = dsp.CICDecimator(Name,Value) creates a CIC decimation object with each specified property set to the specified value. Enclose each property name in single quotes. You can use this syntax with any previous input argument combination. Factor by which the input signal is decimated, specified as a positive integer. 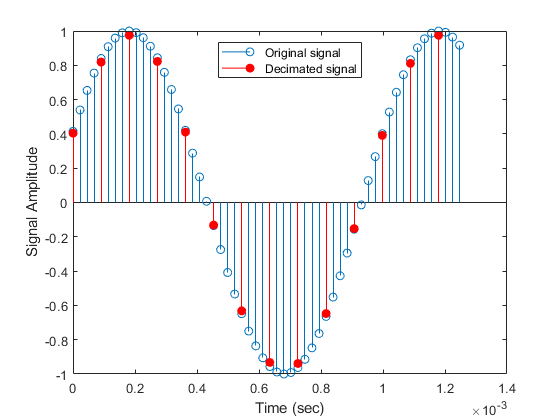 Differential delay value used in each of the comb sections of the filter, specified as a positive integer. For details, see Algorithms. If the differential delay is a built-in integer data type, the decimation factor must be the same integer data type or double. For example, if the differential delay is an int8, then the decimation factor must be an int8 or double. Number of integrator and comb sections of the CIC filter, specified as a positive integer. This number indicates the number of sections in either the comb part or the integrator part of the filter. The total number of sections in the CIC filter is twice the number of sections given by this property. Full precision – The word length and fraction length of the CIC filter sections and the object output operate in full precision. Minimum section word lengths – Specify the output word length through the OutputWordLength property. The object determines the filter section data type and the output fraction length that give the best possible precision. For details, see getFixedPointInfo and cicDecimOut argument. Specify word lengths – Specify the word lengths of the CIC filter sections and the object output through the SectionWordLengths and OutputWordLength properties. The object determines the corresponding fraction lengths to give the best possible precision. For details, see getFixedPointInfo and the cicDecimOut argument. Specify word and fraction lengths – Specify the word length and fraction length of the CIC filter sections and the object output through the SectionWordLengths, SectionFractionLengths, OutputWordLength, and OutputFractionLength properties. Fixed-point word lengths to use for each filter section, specified as a scalar or a row vector of integers. The word length must be greater than or equal to 2. If you specify a scalar, the value applies to all the sections of the filter. If you specify a vector, the vector must be of length 2 × NumSections. This property applies when you set the FixedPointDataType property to 'Specify word lengths' or 'Specify word and fraction lengths'. Fixed-point fraction lengths to use for each filter section, specified as a scalar or a row vector of integers. The fraction length can be negative, 0, or positive. If you specify a scalar, the value applies to all the sections of the filter. If you specify a vector, the vector must be of length 2 × NumSections. This property applies when you set the FixedPointDataType property to 'Specify word and fraction lengths'. Fixed-point word length to use for the filter output, specified as a scalar integer greater than or equal to 2. This property applies when you set the FixedPointDataType property to 'Minimum section word lengths', 'Specify word lengths', or 'Specify word and fraction lengths'. Fixed-point fraction length to use for the filter output, specified as a scalar integer. This property applies when you set FixedPointDataType property to 'Specify word and fraction lengths'. cicDecimOut = cicDecim(input) decimates the input using a CIC decimator. Data input, specified as a vector or matrix. The number of rows in the input must be a multiple of the DecimationFactor. If the input is of single or double data type, property settings related to the fixed-point data types are ignored. Decimated output, returned as a vector or a matrix. The output frame size equals (1 ∕ DecimationFactor) × input frame size. The complexity of the output data matches that of the input data. If the input is single or double, the output data type matches the input data type. If the input is of built-in integer data type or of fixed-point data type, the output word length and fraction length depend on the fixed-point data type setting you choose through the FixedPointDataType property. WLoutput –– Word length of the output data. FLoutput –– Fraction length of the output data. WLinput –– Word length of the input data. FLinput –– Fraction length of the input data. NumSect –– Number of sections in the CIC filter specified through the NumSections property. The WLinput and FLinput are inherited from the data input you pass to the object algorithm. For built-in integer inputs, the fraction length is 0. When the FixedPointDataType property is set to 'Specify word and fraction lengths', the output word length and fraction length are the values you specify in the OutputWordLength and OutputFractionLength properties. For a list of filter analysis methods this object supports, type dsp.CICDecimator.helpFilterAnalysis in the MATLAB® command prompt. For the corresponding function reference pages, see Analysis Methods for Filter System Objects. Create a dsp.CICDecimator System object™ with DecimationFactor set to 4. Decimate a signal from 44.1 kHz to 11.025 kHz. Create a fixed-point sinusoidal input signal of 1024 samples, with a sampling frequency of 44.1e3 Hz. Decimate the output with 16 samples per frame. Plot the first frame of the original and decimated signals. Output latency is 2 samples. Using the info method in 'long' format, obtain the word lengths and fraction lengths of the fixed-point filter sections and the filter output. Using the getFixedPointInfo function, you can determine the word lengths and fraction lengths of the fixed-point sections and the output of the dsp.CICDecimator and dsp.CICInterpolator System objects. The data types of the filter sections and the output depend on the FixedPointDataType property of the filter System object™. Create a dsp.CICDecimator object. The default value of the NumSections property is 2. This value indicates that there are two integrator and comb sections. The WLs and FLs vectors returned by the getFixedPointInfo function contain five elements each. The first two elements represent the two integrator sections. The third and fourth elements represent the two comb sections. The last element represents the filter output. By default, the FixedPointDataType property of the object is set to 'Full precision'. Calling the getFixedPointInfo function on this object with the input numeric type, nt, yields the following word length and fraction length vectors. For details on how the word lengths and fraction lengths are computed, see the description for Output Arguments. If you lock the cicD object by passing an input to its algorithm, you do not need to pass the nt argument to the getFixedPointInfo function. The output and section word lengths are the sum of input word length, 64 in this case, and the number of sections, 2. The output and section fraction lengths are 0 since the input is a built-in integer. Release the object and change the FixedPointDataType property to 'Minimum section word lengths'. Determine the section and output fixed-point information when the input is fixed-point data, fi(randn(8,2),1,24,15). Change the FixedPointDataType property to 'Specify word and fraction lengths'. Determine the fixed-point information using the getFixedPointInfo function. The section and output word lengths and fraction lengths are assigned as per the respective fixed-point properties of the cicD object. These values are not determined by the input numeric type. To confirm, call the getFixedPointInfo function without passing the numerictype input argument. To specify the word lengths of the filter section and output, set the FixedPointDataType property to 'Specify word lengths'. The getFixedPointInfo function requires the input numeric type because that information is used to compute the section and word fraction lengths. For more details on how the function computes the word and fraction lengths, see the description for Output Arguments. The CIC decimation filter decreases the sample rate of an input signal by an integer factor using a cascaded integrator-comb (CIC) filter. The CIC filters are an optimized class of linear phase FIR filters composed of a comb part and an integrator part. HI is the transfer function of the integrator part of the filter. HC is the transfer function of the comb part of the filter. N is the number of sections. The number of sections in a CIC filter is defined as the number of sections in either the comb part or the integrator part of the filter. This value does not represent the total number of sections throughout the entire filter. R is the decimation factor. M is the differential delay. For a block diagram that shows the multirate implementation, see Algorithms. The filter H(z) in Definitions is realized as a decimation filter when the N sections of the cascaded integrators are followed by a rate change factor of R, followed by N sections of comb filters. This diagram shows two sections of cascaded integrators and two sections of cascaded comb filters. The unit delay in the integrator portion of the CIC filter can be located in either the feedforward or the feedback path. These two configurations yield identical filter frequency response. However, the numerical outputs from these two configurations are different due to the latency. This block puts the unit delay in the feedforward path of the integrator because it is a preferred configuration for HDL implementation. Hogenauer, E.B. "An Economical Class of Digital Filters for Decimation and Interpolation." IEEE Transactions on Acoustics, Speech and Signal Processing. Volume 29, Number 2, 1981, 155–162. Meyer-Baese, U. Digital Signal Processing with Field Programmable Gate Arrays. New York: Springer, 2001. Harris, Fredric J. Multirate Signal Processing for Communication Systems. Indianapolis, IN: Prentice Hall PTR, 2004. The fixed-point signal diagram shows the data types that the dsp.CICDecimator object uses for fixed-point signals. secWL is the section word length you specify through the SectionWordLengths property. secFL is the section fraction length you specify through the SectionFractionLengths property. outWL is the output word length you specify through the OutputWordLength property. outFL is the output fraction length you specify through the OutputFractionLength property. The value of NumSections in this diagram is 2.